China Southern doesn't really do special schemes however being a Skyteam member it has painted several aircraft into the alliance colours including the Boeing 777-21BER B-2056 (msn 27525 / ln 66). 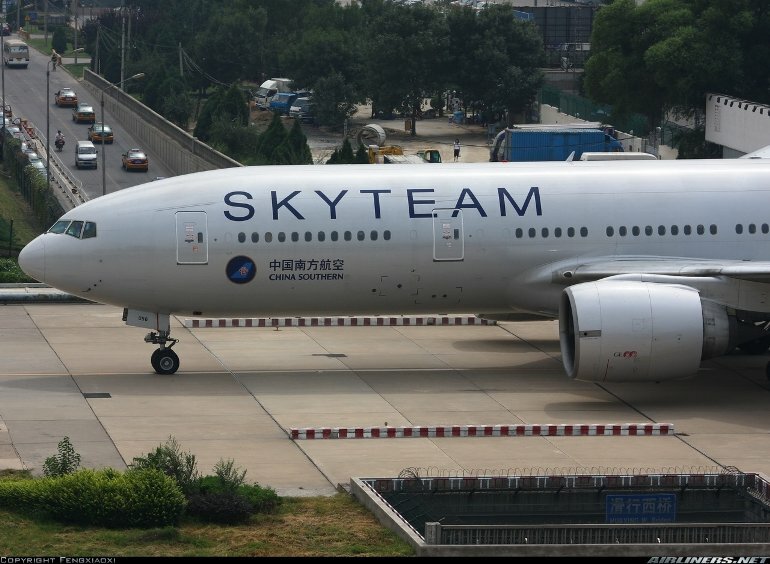 The Skyteam scheme is deceptively complex so how have two manufacturers approached it and which has the best 777? You can clearly see above that Phoenix and JC Wings have taken very different interpretations of the colour onto the model! Being charitable JC Wings have fallen foul of the colour issue mentioned above as their version is far too light and the grey rather yellowish. The Phoenix grey looks perhaps a little dark but is much closer to the real colour (i.e. the top 3 photos), which I should add make up the majority of the photos of the aircraft on Airliners.net. It is a little alarming that the two models can be so far apart. I'm usually rubbish when it comes to colours but even I can notice this difference! I should add also that Dragon Wings have also made this model and their version appears to be natural metal - so that's 3 different models with 3 completely different colours. The Boeing 777 hasn't featured in a mould review as of yet but its common knowledge that Phoenix have the best 777 mould in 1/400 - so is that correct? Phoenix and JC Wings/Gemini certainly make the majority of 777s and both moulds are recent enough to be seamless at the wingroot. Looking at the nose of the two models the overall shape of the mould is good. The Phoenix looks slightly pointier but I think this is mainly an optical illusion caused by the cockpit printing and the fact the JC Wings version sits higher on its gear. It is unfortunately the printing that really lets down the JC Wings. The cockpit windows are undoubtedly too high and the wrong shape. I'd say the Phoenix cockpit windows are a little low at the front top but they are at least positioned properly and the right size. The Phoenix model also has better nosegear and tyres/hubcaps. They are more detailed, better sized and the right colour. Lastly I would say the text and roundel colours are wrong on the JC Wings and the Skyteam text looks a bit too thick, whilst conversely the China Southern titles look a bit too thin. There's a decent model in the JC Wings but the finishing has botched it. At the rear end of the model the Phoenix sits higher than the JC Wings yet its tail is the same height. The tail is definitely larger on the JC version but frankly its bloody hard to tell which is correct. One thing the JC model does have is a notch at the end of the fuselage. Looking at the photos above I just can't see this, instead it looks filled in to me. Then again the Phoenix on the port side doesn't show the outline of this notched area at all so both models are at fault here for different reasons. The JC versions also has some extra detailing at the rear but the thing is I just can't see that on the real thing. In this area the JC model actually beats the Phoenix for me. Its not the mould itself (the Phoenix maingear are much better than the JC ) as both look fine but the detailing. The JC Wings model has a lot more from maingear doors to various dots and markings on the fuselage and engines to the flaps on the horizontal stabilisers. Note that technically this JC model was made by Flightline400 however I believe they are, or were, just a sub-brand of JC Wings. The winner has to be Phoenix - the mould just has a better feel to it, helped especially by the gear and the cockpit window printing. Since we don't spend a lot of time staring at the belly of our models JC Wings winning on that point doesn't equate to much. I had bought the JC Wings / Flightline400 model many years ago and the Phoenix was its replacement when it became obvious the JC Wings didn't fit with any of my other Skyteam coloured aircraft. Both are ok but for me the Phoenix colour and cockpit windows are the primary deciders on this occasion.